This set of tricky Power Electronics questions and answers focuses on “Choppers-5”. Explanation: It is a step-up/step-down chopper, the C maintains the load voltage constant. Explanation: During Ton, current flows from Vs-CH-L-Vs. Current through L rises from I1 to I2 and Vs appears across the inductor and load as they are in parallel. 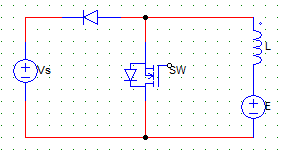 Voltage drop at the diode has to be considered as zero. For duty cycle is less than 0.5, the circuit behaves like a step down chopper. Hence, Vo < Vs. Explanation: When the chopper switch is off, polarity of emf induced in the inductor L gets reversed biased. Emf induced in L forward biases the diode D and L starts to discharge from inductor-load-diode-inductor. Explanation: Iavg = [ (I1 + I2)/2 ] Energy stored = Win = Vs x [ (I1 + I2)/2 ] x Ton. Explanation: It is called as a first quadrant chopper as the current always flows from source to load and the current and voltage both are always positive. Explanation: During Ton, SW is on and vo = 0 as the switch S.C’s the load. E drives current through L and charges it. Explanation: When switch Is off, Vo = E + Ldi/dt exceeds source voltage Vs and D (diode) is forward biased and begins to conduct. Explanation: The load voltage Vo = E + L(di/dt) is greater than Vs, hence it is a step-up chopper. Explanation: The type-C chopper is a two quadrant chopper, it operates in the 1st and the 2nd quadrant. It has type-A and type-B choppers connected in parallel. 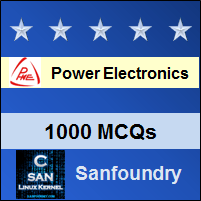 To practice tricky questions and answers on all areas of Power Electronics, here is complete set of 1000+ Multiple Choice Questions and Answers.